Dr. Kirti S. Pingle is an Ayurveda practitioner formally trained in India, with extensive experience for almost a decade. She started studying Ayurveda at the age of 17 years. She completed a six-year Bachelor's course in Ayurvedic Medicine and Surgery (B.A.M.S.). After completion of this course, she pursued her interest further and studied Ayurveda towards a master's degree for another 3 years (M.D. Ayurveda). Her training is recognized by the Central Council of Indian Medicine, New Delhi. Dr. Kirti ranked first in MD Ayurveda and also won a Gold Medal from the European Ayurveda academy for her MD dissertation on Diabetes Mellitus. Recently, She was awarded Fellowship of Institute of Indian Medicine (F.I.I.M) for exceptional research in the field of Ayurveda. Dr. Kirti has practiced Ayurveda in India and has teaching and clinical experience. In addition, she is co-editor of the scientific Ayurveda journal " Deerghayu International"
Dr. Kirti S. Pingle is a professional member of NAMA (National Ayurvedic Medical Association) and an approved Ayurvedic practitioner. She meets NAMA criteria for education and experience as a practitioner in the US. Dr. Kirti has started consulting in Chicago IL and northern suburbs. Dr. Kirti is also practices Yoga Therapy. She provides guidance to follow the path of Ashtanga yoga. She advises various yoga poses to the clients suitable to their condition. She also guides individuals for different meditation programs like Matra meditation, Marma meditation and Chakra meditation. Dr. Kirti practices Yoga Therapy for kids. She has completed Rainbow Kids Yoga Teacher Training which was comprehensive, intensive, practical certification course. It's great for parents to find new ways to connect with their children and family, and share a healthy, fun, and non-competitive movement-based activity. Yoga for kids is full of fun, play and lots of giggles! It is useful for kids beacuse it helps to improve concentration, memory and health. Dr. Kirti S. Pingle has been awarded the prestigious "Hind Rattan Award of 2014" for her "outstanding services, achievements and contributions for keeping the "Flag of India High"." Dr. Kirti Pingle is an Ayurveda practitioner from San Diego California, USA; this award, given by the NRI Welfare Society of India, an organization under the umbrella of the Government of India, recognizes Dr. Kirti’s contribution of developing awareness about Ayurveda & yoga in the west. The Award is given to a rare and select number of persons of Indian origin for their achievements that enrich the life of the country of new residence. Dr. Kirti received the award in New Delhi on January 25, 2014 at the 33rd International Congress of non-resident Indians (NRIs). The Hind Rattan Award (translated "Jewel of India") is awarded annually to select members of the worldwide Indian diaspora (NRIs and Persons of Indian Origin) by the NRI Welfare Society of India at a glittering ceremony, held since 1981 on the eve of Republic Day of India (January 26). Dr. Kirti Pingle was felicitated with a certificate of honor by Governor Dr. Bhisma Narain Singh, Governor B.P. Singh, Supreme Court Justice Markandey Katju, former Election Commissioner Dr. G.V.G. Krishnamurthy, and AICC secretary Major Ved Prakash, AICC secretary Dalbir Singh, and NRI secretary Gurinder Singh. 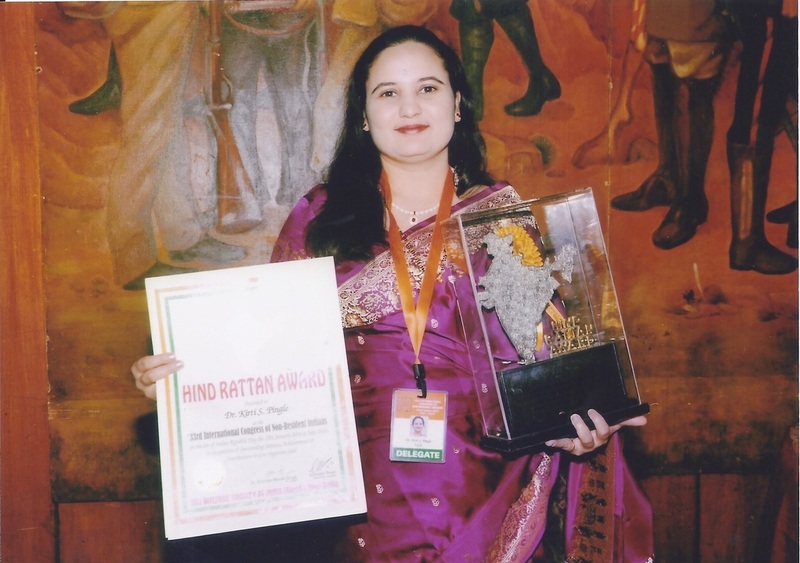 Dr. Kirti Pingle with "Hind Rattan Award"
The award carries plaque and certificate of honor. Dr. Kirti received the award from Central Minister Tariq Anwar in a gala ceremony in the historic Ashok Hall on the eve of Indian Republic Day on 25th January, 2014 in New Delhi. Dr. Kirti participated in Republic Day parade celebrations as a special guest of the NRI diaspora. In her address, at the 33rd International Congress of NRIs in New Delhi, she spoke about current health issues in young generations. She addressed the need of fulfilling emotional & spiritual needs of youngsters with help of Ayurveda & yoga to achieve happy healthy life. Dr. Kirti is also Instructor at San Diego College Of Ayurveda since the past two years, teaching Ayurveda and Panchakarma. Dr. Kirti S. Pingle has been awarded the prestigious "Bharat Gourav Award of 2015" for her outstanding services, achievements on the occasion of Bharatiya Pravasi Dina. This conference was held in New delhi on January 6th, 2015. This Annual function " Global Participation in India's Economic development" was organised by India International Friendship Society (IIFS). Every year we celebrate Pravasi bhartiya dina in the honor of Mahatma Gandhi. Since 2015 marks the hundredth anniversary of the return of the greatest Pravasi of all, Mahatma Gandhi from South Africa, the Global Friendship Day was celebrated in grand way. On this occasion, the society confers bharat Gourav award to luminous personalities in India and abroad who glorified India with outstanding contributions to their specialized fields. The award is given by former CBI director of India Mr. Joginder Singh and Mr. Bhishma Naraiyan Sing former governor of Assam and Tamilnadu. Dr. Kirti Pingle was felicitated with plaque and a certificate of honor. Dr. Kirti Pingle was honored with the prestigious Mahatma Gandhi Pravasi Rattan Award in Washington DC at Capitol Hill on 13 May 2015. Felicitation at the Embassy of India in Washington DC with the Minister of Personnel & Community Affairs.